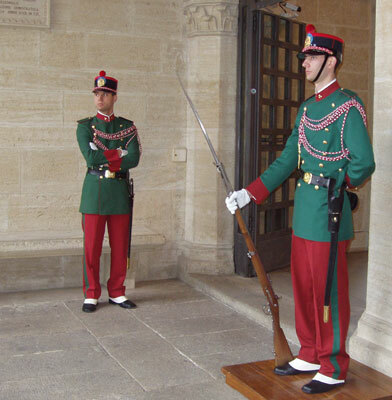 These soldiers are guarding the Parliament Building in one of the world’s smallest countries – the Republic of San Marino. Perched on the slopes of Mount Titano in central Italy, San Marino has an area of only 23 square miles. I’ve been to shopping malls nearly as big. Small, yes, but San Marino’s ancient castles, spectacular views of the countryside below, and status as an independent nation make it hugely popular with tourists. Some people visit just to have their passport stamped. Indeed, this tiny country attracts more than two million visitors each year. That’s a lot of tourists when you consider that only 30,000 people actually live here and San Marino has no airport or train service. The weather on this particular day was miserable. Not long after I took this picture, it began to pour. Moments later, the guards abandoned their posts and scurried inside for cover. Foreign powers take note. If you’re going to invade San Marino, your chances are much better on a rainy day. 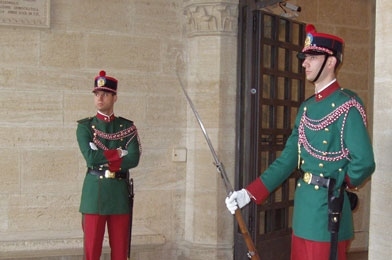 CITTA DI SAN MARINO, San Marino –Clad in bright green and red uniforms, two soldiers stand guard outside this tiny country’s main government building. Moments later, it begins to pour and the guards abandon their posts and scurry inside for cover. If you’re going to invade San Marino, your chances are much better on a rainy day. Rain or shine, foreign invaders have pretty much left San Marino alone since it was founded in 301 AD, making it the oldest republic in the world. It’s also one of the world’s smallest countries. Perched on the slopes of Mount Titano in central Italy, San Marino has an area of only 23 square miles, less than one-third the size of Gilbert. Small, yes, but San Marino’s ancient castles, spectacular views of the countryside below, and status as an independent nation make it hugely popular with tourists. 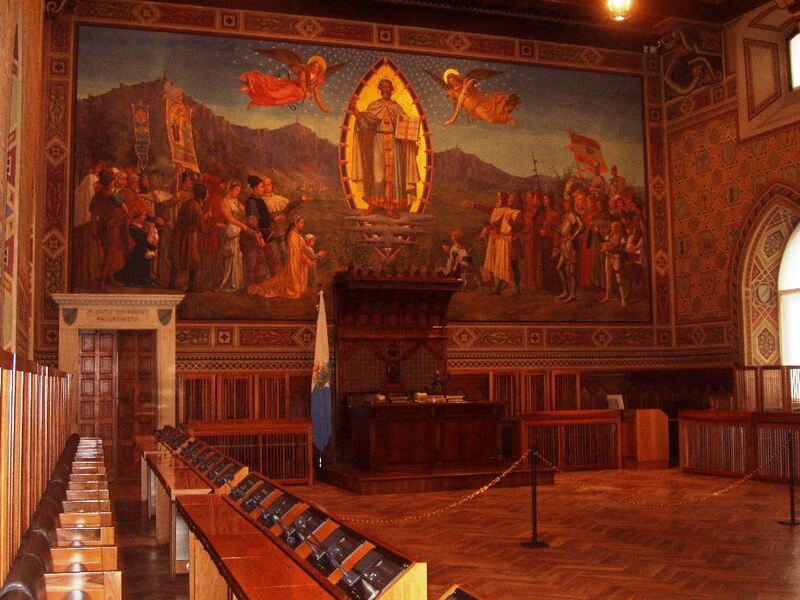 According to San Marino’s State Tourist Bureau, 2.2 million people visited the country last year. That’s a lot of tourists when you consider that only 29,000 people actually live here and San Marino has no airport or train service. My wife and I recently visited San Marino as part of a week-long trip to Italy. After flying to Rome nonstop from Moldova, we took a five-hour train trip to Rimini, an Italian resort town on the coast of the Adriatic Sea, only 10 miles from San Marino. A bus took us the rest of the way. As our bus wound its way up the mountain, I thumbed through a brochure put out by San Marino’s government, showing some of the most scenic photos I had ever seen. I checked my camera battery to make sure it was fully charged. I might as well have left it back at the hotel. A few minutes after we arrived, a storm planted itself over the mountain and it didn’t stop raining the rest of the day. San Marino’s famed medieval castles were completely obscured by fog. With little to see other than souvenir stores and restaurants lining the flooded cobblestone streets, my wife took the first bus back to our hotel in Rimini. I decided to stick it out for a few more hours in hopes that the weather would improve. It didn’t and the heavy wind and cold rain made sightseeing impossible. But in one sense, I had already achieved my ultimate goal for the day once I crossed the border from Italy into San Marino. 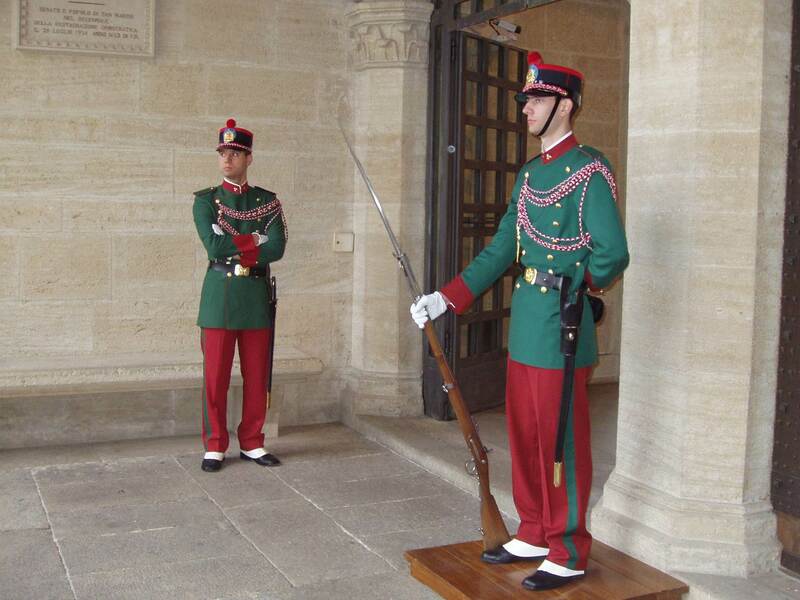 You see, like a lot of other people who visit San Marino, I’m a country counter. My goal is to visit as many countries as possible, big or small. Some travelers collect stamps, coins, pins or native handicrafts. I collect countries. Would I have gone to the time and expense to visit San Marino if it were just a mountaintop community that was part of Italy? Not likely. Apparently, I’m not alone. I asked an official with the State Tourism Bureau to estimate how many tourists visit San Marino because it’s an independent country. “Most of them,” she acknowledged. The country has found ways to capitalize on its independence. San Marino’s postage stamps and commemorative coins bring in revenue. And while you don’t need to show a passport or any other document to enter the country, many visitors choose to pay $3 to have their passports stamped with San Marino’s coat of arms. I’m now up to 62 countries. And that doesn’t include places I’ve been that aren’t sovereign states, like Tahiti (technically part of France) or Gibraltar (part of the United Kingdom). When I start feeling pretty proud of myself, I meet someone like Geoff in Moldova, a fellow American and country-counter. Geoff has been to more than 90 countries. He even visited San Marino a few weeks before I did. 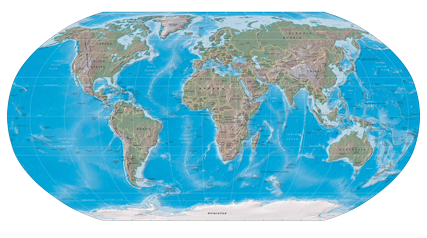 The U.S. State Department recognizes 192 independent countries around the world. I’ve still got a lot of work to do before my collection is complete. But every country I’ve visited is much more than just a pin on the map. Like San Marino, each has its own unique history and offers enriching things to see and do. Just be sure to check the weather forecast before you go.